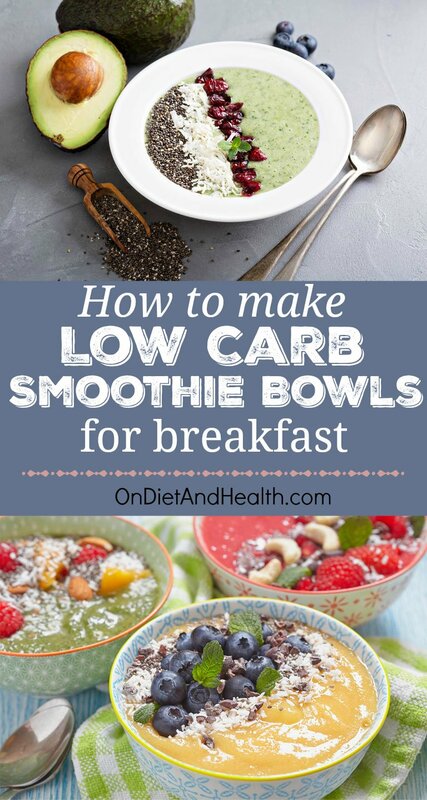 Make a Low Carb Smoothie Bowl! Beautiful smoothies thick with your favorite toppings for crunch or a burst of flavor. Rich in nutrients, they can make a great snack or breakfast if you cut the carbs and add extra protein. Is Your Smoothie Really a Sugar Bomb? Most smoothies, even “Paleo” Smoothies, rely heavily on juice and fruit. That’s not a balanced meal. It’s a Sugar Bomb! Even with protein powder and a few nuts it’s still mostly carbohydrate. 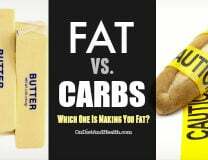 Humans need protein, fat and lots of vegetable matter. Fruit is really just a condiment. Humans have poor glucose regulation when we eat foods we did not evolve to eat in any quantity. That’s why bread, pasta, sodas and desserts have made us sick and overweight. 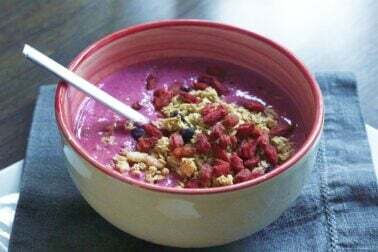 Ignore Smoothie Bowl recipes made mostly from fruit. Even though it’s trendy, it’s not real food. seeds either – they’re high in Omega 6. Chia seeds can be a strong laxative to some people by the way and Hemp Hearts and other shelled nuts and seeds are often rancid. But no, I’m not really a Party Pooper! 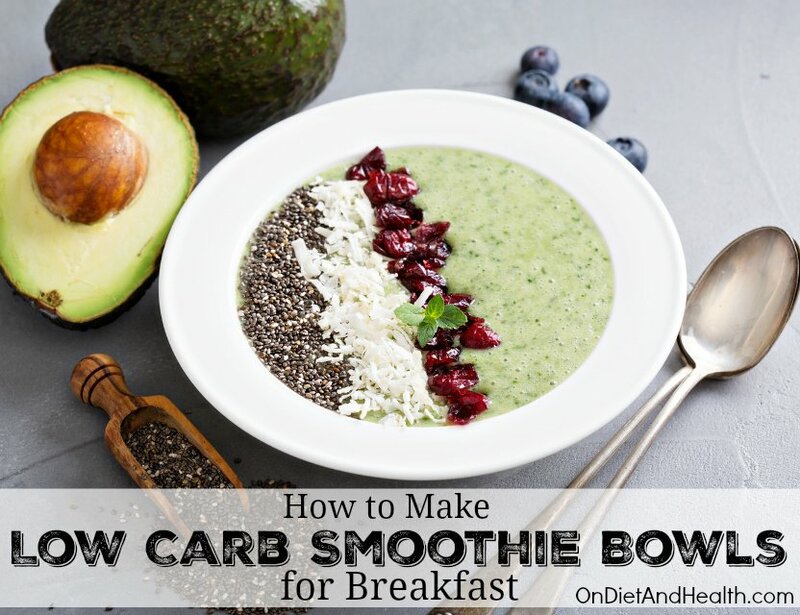 You can make outstanding Smoothies and Bowls with the foods listed below. And this post and this one will give you additional facts on making a real meal. 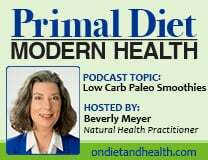 Or listen to my Primal Diet – Modern Health podcast on this! Like other meals you need to balance protein, fat and carbohydrates to make a blend that won’t leave you hungry or “hangry” soon after. One with enough protein and fat calories to keep you from undereating. Consuming too few calories can cause low thyroid function – it’s an evolutionary tool that lowers our metabolism when food is scarce. This is why most diets fail. Fasting and undereating just lowers the rate at which food is burned for fuel. 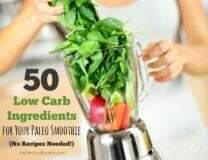 In the Paleo Diet (my Diet For Human Beings DVD/Video) you eat heartily, with plenty of fats, proteins and vegetables to fill you up and keep you satisfied. We can do the same with our Smoothie Bowls. “I can eat the whole thing in no time at all! Is that OK?” No, you still need to chew your food!! That’s one reason for the toppings. They “make” you slow down and chew. “Does everything have to be raw?” No, you can include cooked foods as well. In fact, briefly blanching collards and kale removes the goitregens which can prevent you from absorbing iodine. “I didn’t like the taste of the blended batch I made”. What now? Try adding cinnamon, cucumber or a little banana to change the flavor. Taste test your blend before you scoop it into the bowl the next. See other suggestions below. 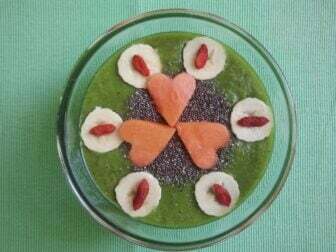 If you made your low carb Smoothie Bowl correctly you’ll feel full and happy until your next meal. If you get hungry or anxious within an hour or two, you probably used too much fruit and not enough protein and fat. I have a full serving of protein on the side when I eat my veggies smoothie bowl. I don’t use fruit at all except an inch or two of banana for creaminess and sweetness.